Edmund Pettus was a Confederate general during the Civil War and the Grand Dragon of the Alabama Ku Klux Klan after. 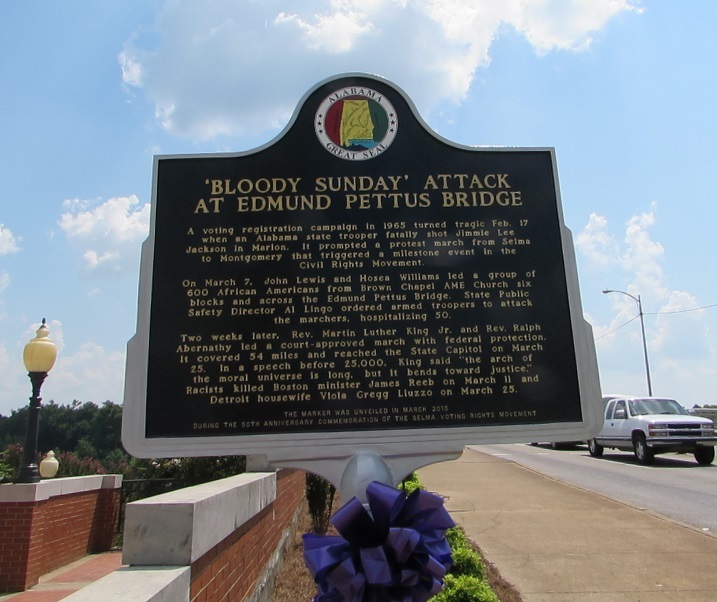 So there’s a delicious irony — an affirmation of karma — that a seminal and ultimately triumphant event in the Civil Rights struggle happened on a bridge named after him. 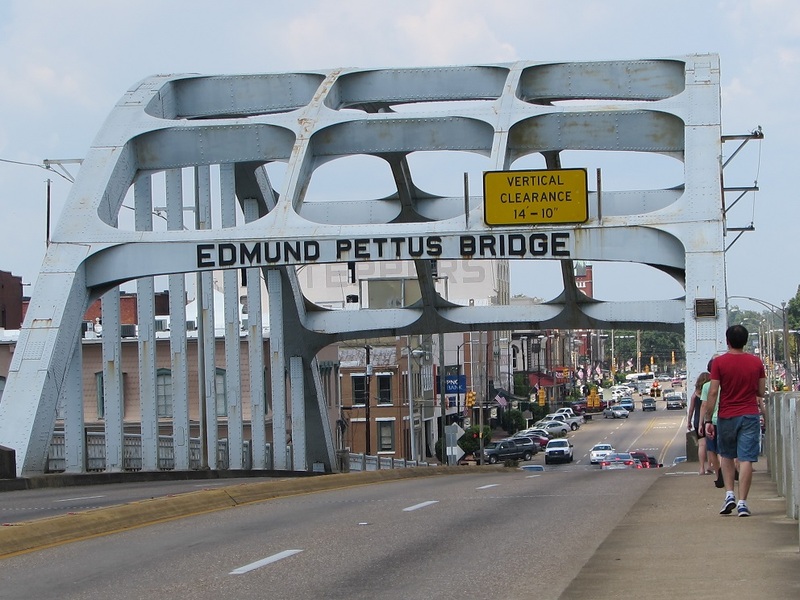 The organized effort to register black voters in Selma was met with (surprise!) resistance by city officials, so Selma Civil Rights leaders put in a call to Martin Luther King and the leaders of the Southern Christian Leadership Conference. The SCLC organized a march from Selma to Montgomery, Alabama’s capitol, 60 miles away, to call attention to their efforts. They got more attention than they predicted. Six hundred marchers headed out of Selma on March 7, 1965 but got only as far as the Edmund Pettus Bridge. As they came over the crest of the bridge, they saw State troopers and local militia, waiting to take them down as soon as they cross over the city line. The marchers knew that nothing good would happen once they got to the troopers, but they moved forward anyway. The bridge marked our entry into town. 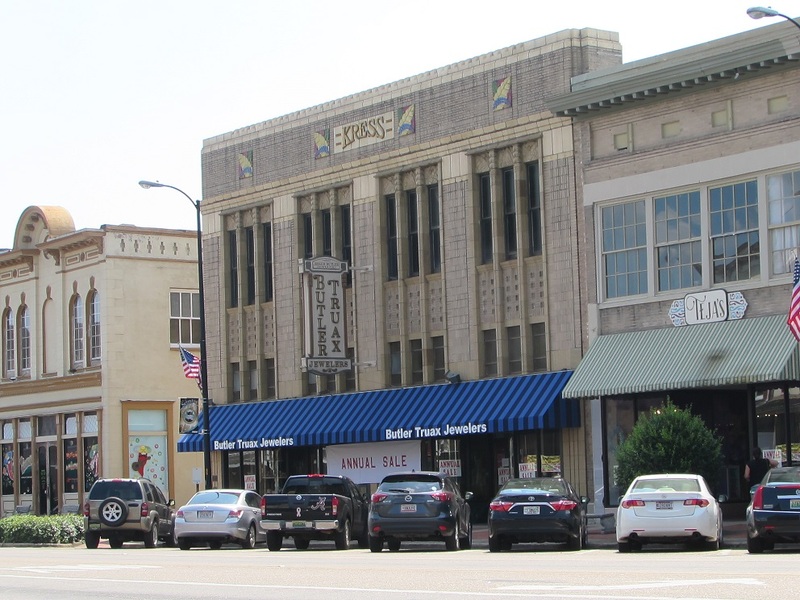 The National Park Service’s Selma Interpretive Center was just on the other side, at the end of a quiet street that looked like the anchor for town’s historic area. We went into the interpretive center and found a teeny tiny office and a few exhibits. “We’re about to start a major expansion,” explained the ranger. Meanwhile, we were glad we stopped at the Lowndes Interpretive Center for the full story. After a quick run through the exhibits, we got to the main purpose of our visit to Selma: to take a walk across the bridge. The sidewalk is narrow but there were only a handful of other people on it — all looking like tourists doing the same thing that we were. We paused at the crest, to imagine what it would be like to see rows of State troopers in riot gear, holding billy clubs, just waiting for our approach. It’s not hard to imagine. The landscape facing east was dry and dusty and more than a little depressed — like it hadn’t changed much in 50 years. We paused for a few minutes at a memorial park on the east side of the bridge, then crossed the street and walked back. We had planned to leave town right after a quick walk across the bridge, but the town itself (on the west side of the bridge) looked so cute that we decided to set a spell. In the south, macaroni and cheese is a vegetable. And everything gets washed down with sweet tea, the official drink of the American South. I admit, I became a biscuit and sweet tea addict during the trip. The good news for my waistline: sweet tea is only made right in the deep south. Once we got as north as South Carolina, it wasn’t the same, addictive drug any more. After lunch we wandered around the small but charming downtown area. They had some beautiful art deco buildings. Both the ladies were African American and both had lived in Selma all their lives. Neither had been involved in Bloody Sunday: one had been out of town that weekend, the other had not left her house. There’s a campaign afoot to change the name of the Pettus bridge. If that were to happen, my vote would be to rename it after Amelia Boynton Robinson. She was a Selma Civil Rights leader and marcher who became the face of Bloody Sunday when a photograph of her beaten, unconscious body was published by newspapers around the world. She survived the beating and died last month, just a few days past her 110th birthday. 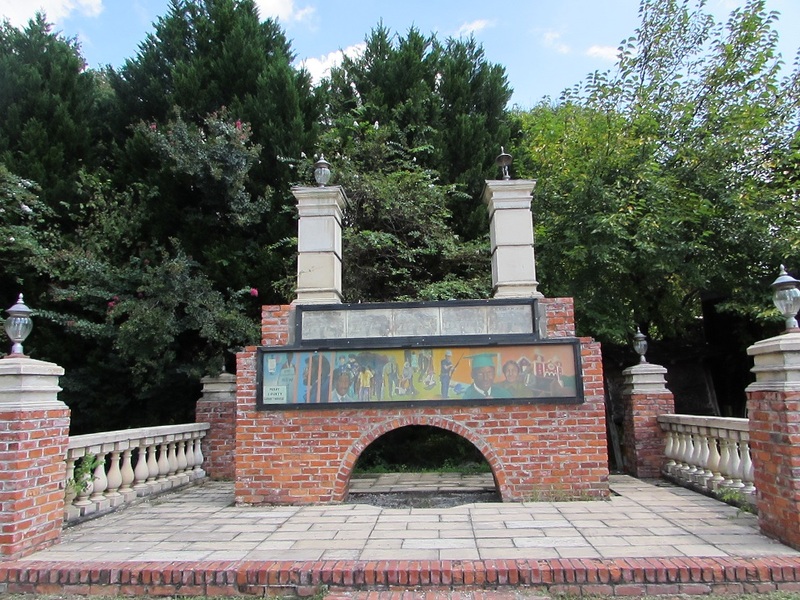 Gallery | This entry was posted in Alabama and tagged Amelia Boynton Robinson, Edmund Pettus, Selma Interpretive Center. Bookmark the permalink. I’m so grateful for your blog because there’s so much history I don’t know yet. I haven’t seen the movie yet either. Do you recommend it? Thanks for the lessons. That’s so nice of you to say. I have not seem the movie. Grant and I agreed that now that we’ve been to Selma, we must see it. I’ll be in your neck of the woods in a couple of weeks — Portsmouth, Ipswich and the Connecticut River Valley are on the itinerary. And the mountains, along with a million other people. Thank you. I learned so much from my visit to Selma.